Jason Hooper is a music theorist specializing in Schenkerian theory and analysis, historical and contemporary theories of form, and new approaches to theory pedagogy. He earned a PhD in Music Theory from the CUNY Graduate Center as well as an MM in Music Theory and a BM in Trombone Performance, both from Indiana University’s Jacobs School of Music. Hooper’s dissertation, titled “Heinrich Schenker’s Early Approach to Form, 1895–1935: Implications for His Late Work and Its Reception,” chronicles how Schenker’s ideas regarding musical form changed over time. Preliminary research on this topic earned the Patricia Carpenter Emerging Scholar Award from the Music Theory Society of New York State and appears in Theory and Practice (2011), with additional work appearing in Rivista di Analisi e Teoria Musicale (2015). He also reviewed Schenker Documents Online for the Journal of the American Musicological Society (2016). Hooper has read papers at annual meetings of the Society for Music Theory, the Seventh International Conference on Music Theory (Tallinn, Estonia), and the European Music Analysis Conference (Leuven, Belgium), among others. Currently he serves on the editorial board of the journal Intégral. 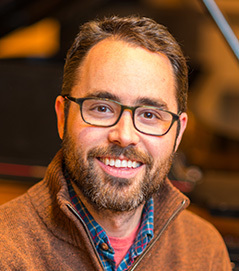 Professor Hooper teaches a variety of courses at UMass Amherst, from undergraduate courses on music theory and aural skills to graduate courses on Schenkerian analysis, recent theories of form, and analysis and performance. He received a UMass Residential First-Year Experience Student Choice Award in 2011 for helping first-year students succeed academically. Through a Fellowship for Innovative Teaching from the UMass Center for Teaching & Faculty Development in 2014–15, he redesigned the first year of music theory at UMass Amherst around more collaborative and student-centered pedagogical approaches, as featured in the Daily Hampshire Gazette (http://www.gazettenet.com/Archives/2015/10/20artMusicTheory-hg-112015). In 2018, Prof. Hooper was appointed Coordinator of Music Theory.